However, mortgage rates likely won't be affected. The Federal Reserve Officially raised interest rates for the first time this year and forecasts a steeper path for borrowing costs in 2017. The immediate effect on mortgage bonds/rates has been negative, which has lead to lenders re-pricing their mortgage rates for the worse. For example, this morning the 15 Year Fixed rate for a $417,000 loan amount started at 3.375% with no points, but after the Fed Rate hike this rate now comes at 0.25 points ($1,042.50) charged to the borrower. In the short term we are advising our clients to lock the available interest rate until volatility dies down. News that OPEC will cut oil production sent Stock prices higher today at the expense of Bond prices as yields surged. In addition, ADP reported that private payrolls rose more than expected. Post-election events and today's higher yields have sent mortgage rates to 2016 highs. After a quiet Thanksgiving week, we are seeing mortgage rates improve today. This past Friday, we saw 4.0% at 1 point cost ($4,170 fee | 4.112% APR) on a $417,000 loan amount, whereas today the same rate would only cost 0.5 points ($2,085 | 4.071% APR). Substantial savings to start the week! This week's economic report calendar is on the heavy side with everyone's focus on November Jobs report. We are starting the week floating our clients, but will keep our eye on the mortgage bond market for alerts on when/if to lock current interest rates. Email, text, or call us for any mortgage rate scenarios. "Stock prices have hit record highs, which is forcing Bond yields higher. Subsequently, mortgage rates are at the 2016 highs. Mortgage Bonds/Rates are near unchanged this morning in the absence of any economic data to impact trading." Per Freddie Mac, the 30 Year Fixed Conventional Mortgage Rate is 3.95% with 0.5 points paid by borrower. Fortunately our team offers rates below the national average, here are current available rates we are offering our clients. We are helping clients lower their payments and close on purchases all week, do not hesitate to call or email us with a scenario, even if it's Thanksgiving Day. June Mortgage Rate Update - Effect of "Brexit"
Stocks around the globe are in rally mode after recent polling shows Brits are in favor of staying in the European Union. The so-called "Brexit" vote is this Thursday. When Stocks rally, this typically has a negative impact on Mortgage Backed Securities and the home loan rates tied to them. Global Bond yields are also moving higher, which can negatively impact home loan rates as well. With both technicals and fundamentals working against Mortgage Backed Securities and home loan rates, I recommend locking your mortgage rate for purchases or refinances sooner than later. As of now, interest rates are starting at 3.75% APR for all loan amounts. Down payment, loan program, and property type are a few variables that will effect final interest rate. Mortgage rates rose for the third week, amid data showing a pickup in inflation. “Treasury yields increased heading into this week’s FOMC meeting, partially in response to modestly higher inflation readings,” said Sean Becketti, chief economist of Freddie Mac, in a statement. The 30-year mortgage tends to track movements in the 10-year Treasury. 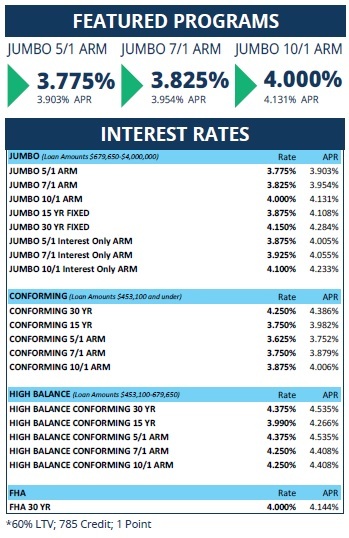 Despite rate increases across the board, we have fortunately been able to maintain interest rates for our Jumbo loans (loans exceeding $625,000) in the 3.625 - 3.75% APR range. Want to close quickly at these low rates? Contact our team, we are approving clients all weekend! In economic news, the Philly Fed Index showed contraction as the manufacturing sector continues to go through a malaise. Weekly Initial Jobless Claims came in lower than expected. With the recent steep drop in Mortgage Bonds we saw a improvement in interest rates this afternoon. At this moment rates as low as 3.75% APR are available depending on loan amount and program, which is near record lows. Ready for Negative Interest Rates? The Fed is now advising U.S. Banks to prepare for the possible scenario of negative interest rates. Although very hypothetical, it is good to be aware of what this means for the consumer. With treasuries and a few global benchmark interest rate indexes at a negative level, this could potentially lead to extremely low, if not negative mortgage interest rates. A recent example was a Spanish Bank that sold mortgages pegged to the Swiss Libor Rate (now negative). Essentially the bank owed interest to their customers, which it couldn't pay (GO FIGURE! ), instead the bank reduced the principal for some of its customers.